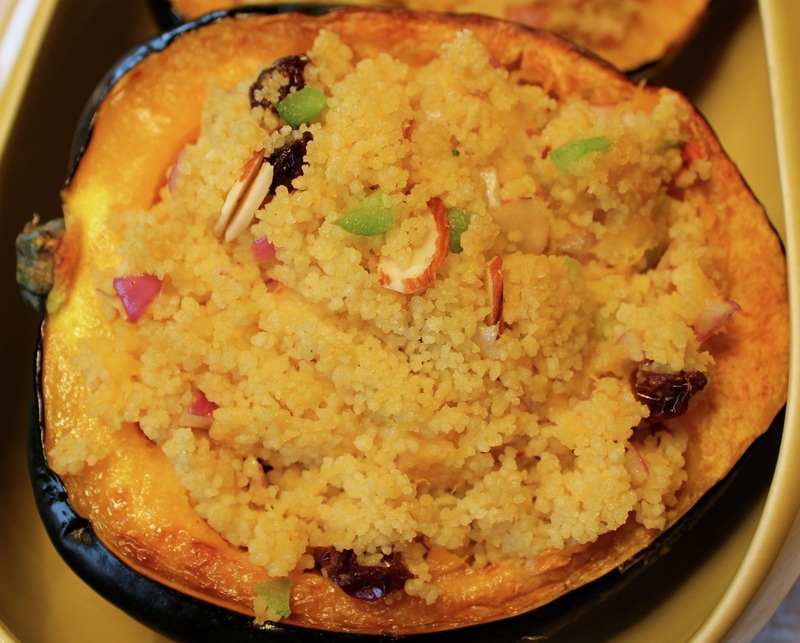 Acorn Squash Stuffed with Couscous makes a beautiful looking and tasting side dish. Cut squash in half lengthwise. Remove seeds and brush melted butter inside and along the cut rim of the squash. Place squash, cut side down on foil liked baking sheet, bake for 30 minutes. Remove squash from oven and turn over, let cool. Scoop out inside of squash leaving 1/4 to 1/2 inch meat around the shell. Place the squash you scooped out into a bowl. Set aside to add to the couscous later. Fluff couscous with fork and add the remaining ingredients including the squash, mix well. Put 1/4 of couscous mixture inside each squash shell. Put filled squash back into oven to warm, about 10 minutes.